Slotted in between North Africa, the Middle East, and Europe, throughout centuries Egypt has developed as an exciting culinary culture. Some dishes were borrowed from others while plenty of tasty foods have been eaten in virtually the same manner since the Pharonic age. Egyptian food is often quite healthy, can be very nutritious, and if you eat like a local, the food is extremely affordable. If you are willing to eat mostly vegetarian, the cost of eating in Egypt can be $1 or less per meal, but if you get into some meat filled dishes you'll spend in the $2 – $5 range per meal. The ultimate staple of all Egyptian cuisine is their version of flatbread known as Arabic bread. 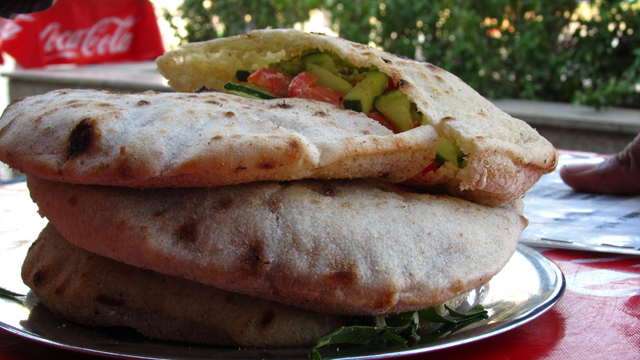 It's sort of a cross between a tortilla and a pita bread, and it's nutritious, filling and extremely cheap! Rice is another common staple in Egyptian food and it is often steamed and mixed with short whole wheat noodles and a bit of oil. 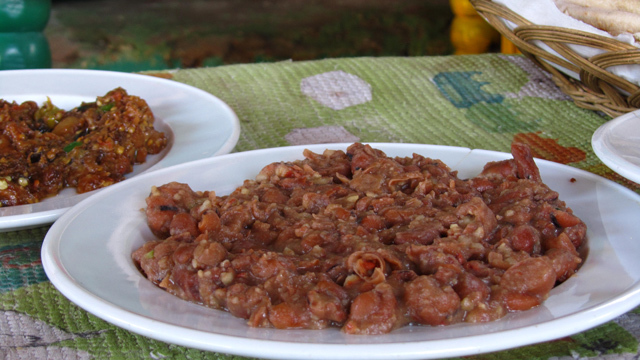 There's no Egyptian street food that's more typical and widely available than ful medames (commonly just referred to as ful), or mashed fava beans. The beans are traditionally cooked in a large clay pot over a fire and mushed into a bean paste that resembles Mexican refried beans. Ful is normally eaten with a stack of Arabic bread and maybe a few Egyptian pickles or tomatoes. Ful was one of those dishes that I ate almost everyday and couldn't get enough of in Egypt. An Egyptian sandwich is a piece of Arabic bread filled with a dish of choice, a scoop of white yoghurt sauce, some chili's, and a handful of pickled vegetables. You get to choose from an array of fillings that may include, eggplant, artichokes, beans, French fries, falafel or whatever else you spot at the stall. At 1 – 2 LE ($0.17 – $0.34) per sandwich, you can keep eating them all day long! 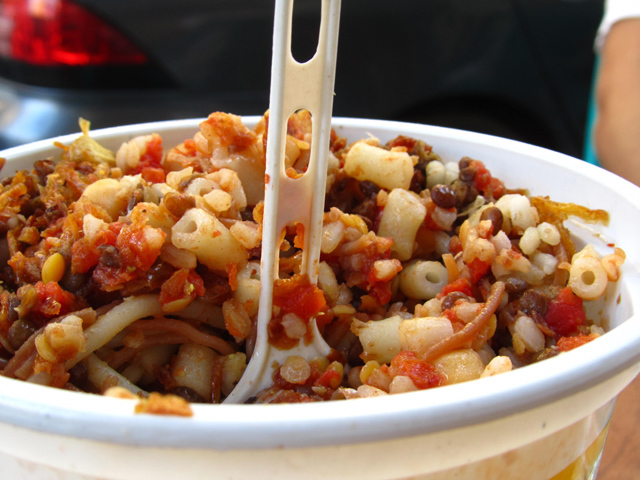 Kushari is one Egyptian street food meal that working class men (and some women) will choose as an ultimate energy boost. The dish consists of pasta, rice, lentils, and chickpeas all jumbled together with tomato sauce in a bowl of carbohydrate overdose. When I was in Egypt, I would down the large size bowl of Kushari and I'd have the energy to walk from one side of Cairo to the other! Meat in Egypt is quite good, though it's a lot more expensive than vegetarian dishes. Lamb, beef and chicken are all popular choices. One of my favorite meat dishes in Egypt is grilled Kofta Kebabs which are made from spiced minced beef or lamb that is roasted over coals on long skewers. 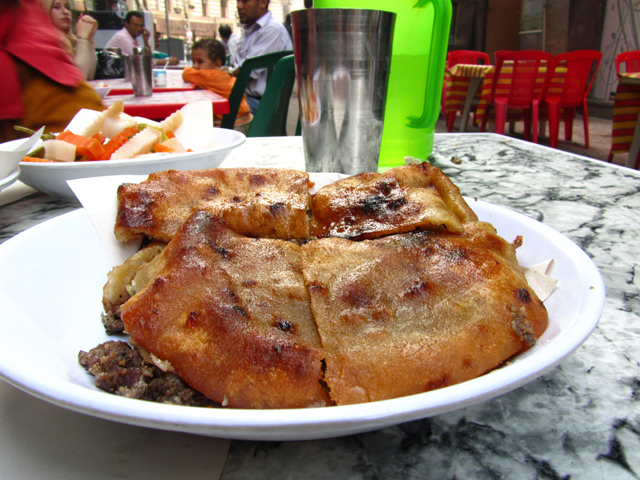 Another favorite is something called a Hawawshy (pictured above) which is an Arabic bread filled with minced lamb, brushed with oil, and scorched in a wood fire oven. There's nothing more refreshing on the streets of Cairo in the blazing heat than a cup of fresh squeezed juice. The most common quick energy juice that people drink on the go is sugar cane juice. At local Cairo juice bars, vendors will line up cups of sugar cane juice as customers walk past, drop a 1 LE ($0.17) coin on the table and gulp down a glass of juice in just a few seconds. 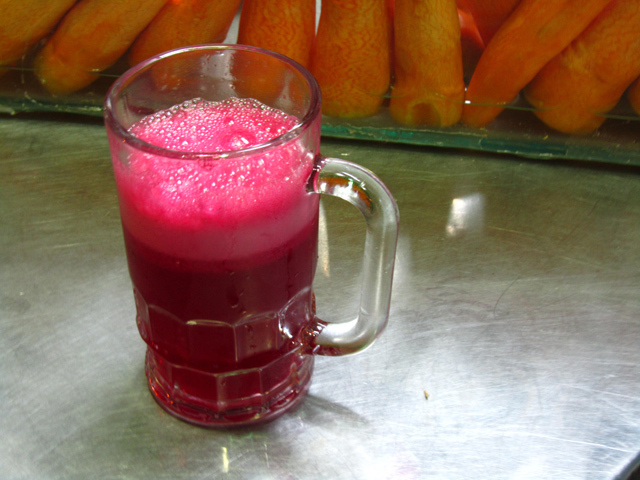 I'd also sometimes dish out the extra money for an ice cold cup of pure pomegranate juice (4 LE – $0.67) or an equally amazing Egyptian fruit coctel (a combination of bananas, apples, mangoes and yoghurt all in a cup). 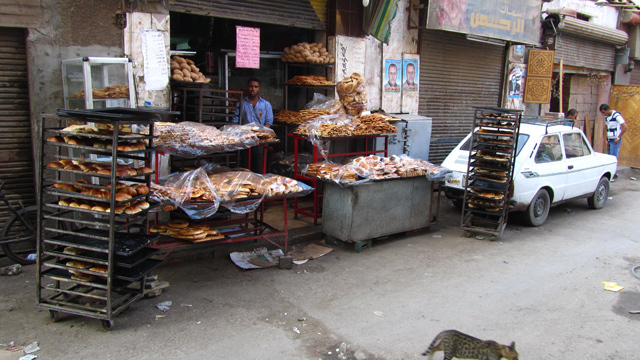 So when you are in Egypt, be sure to take full advantage and devour their lively selection of delicious food!